The Forteresse Royale de Chinon crowns the hill above the town—there's no missing it, especially if you approach the town by crossing the bridge from the south bank of the Loire. The forteresse—or château, if you prefer—is the prime goal of your visit. 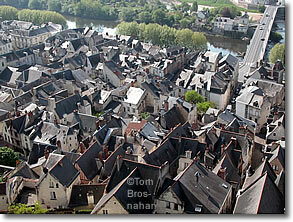 The town of Chinon itself is also a delight, with its narrow streets, old houses and river views. As you'll see from the battlements of the Forteresse, Chinon is surrounded by vineyards and wineries just waiting for you to visit. Town of Chinon from the Forteresse, looking south with the Loire bridge at upper right.